Reversing an invoice is essentially deleting or "undoing" it as if it had never been created. When reversing, all items on the invoice will be returned to inventory, sales information will be removed from the Weekly Accomplishment, and payment information removed for the contact. Open the contact's profile, and select the Account & Invoices tab. Under the Invoice section, select the invoice and either right-click and choose Reverse, or click . 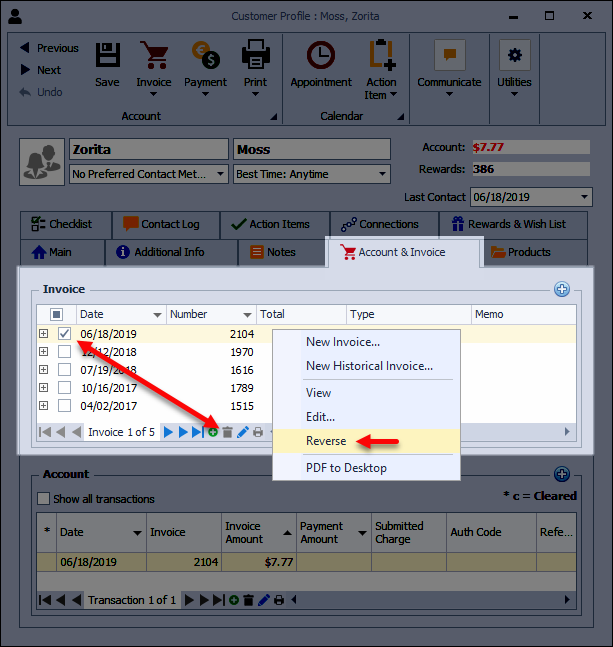 Please Note: Inventory totals will be adjusted even if the original invoice was entered through history.